Salivary glands are compound, tubuloacinar, merocrine, exocrine glands, the ducts of which open into the oral cavity. The main developmental anomalies of the salivary glands are aplasia of the glands, atresia of the ducts, accessory or ectopic glands, and a variety of cysts. Aplasia of one or more glands, which is rare, has been reported in literature. Salivary gland aplasia may be found in some congenital syndromes. 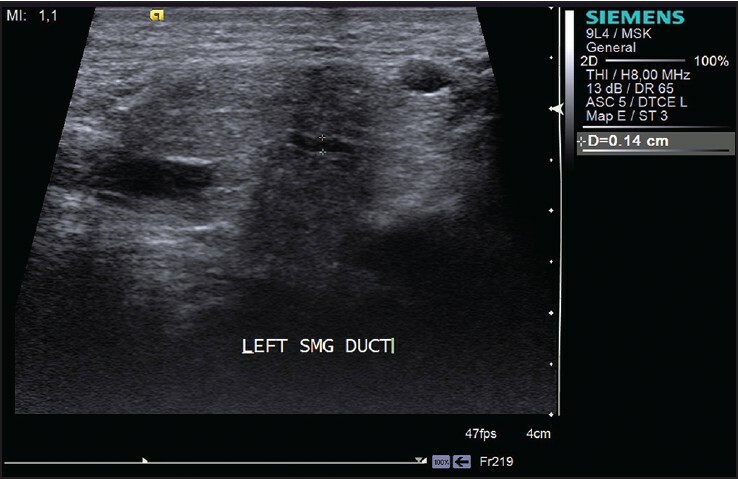 Duct atresia is less infrequent and may affect the submandibular duct, causing occasional cyst formation. Ectopic salivary tissue can be found in the developmental areas of the first and second branchial arches, which include the lateral part of the neck, pharynx or middle ear, and in the lymph nodes or extranodal lymphoid tissue, particularly in the parotid and surrounding area. It may also be found in rare sites within the head and neck region, such as the gingiva and the brain. Such ectopic salivary tissue without an excretory duct can cause salivary fistulas. We are reporting a unique case of enlarged submandibular salivary gland openings in the oral cavity that have not been, to the best of our knowledge, documented yet. A 24-year-old male patient reported to our Outpatient Department with a chief complaint of generalized discoloration of teeth. His medical and dental history was noncontributory. His general physical examination did not reveal any abnormality. His routine clinical examination revealed generalized extrinsic stains and mild calculus deposits on the teeth. 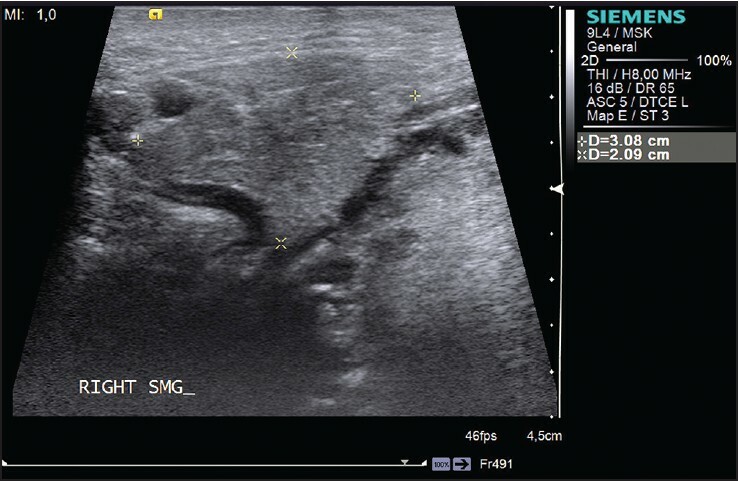 Furthermore, on examination, unusually large bilateral submandibular salivary gland ductal openings were present, well-patent and measuring roughly 3 mm (right side) and 4 mm (left side) in their greatest dimension [Figure 1]. The sublingual caruncles were absent bilaterally. There were no visible signs of inflammation, infection or ductal obstruction. On palpation, the findings were within normal limits. No variation in salivary quality or quantity was observed. The patient was made aware of his clinical findings and was further interviewed for any signs and symptoms associated with salivary gland functioning. The patient did not report any prior history of trauma, pain or swelling in the orofacial region, especially in the submandibular region, nor did he report any symptom of oral dryness, difficulty in speech, mastication, swallowing, or other associated functions. The unstimulated whole salivary collection using the spitting method over five minutes was 1.4 mL (0.28 mL/minute). The obtained saliva was slightly cloudy in appearance with a pH of 6.8 and specific gravity of 1.01. Findings of the blood and serum biochemistry were within normal limits. The patient's mandibular cross-sectional occlusal [Figure 2] and panoramic [Figure 3] radiograph revealed no abnormality. 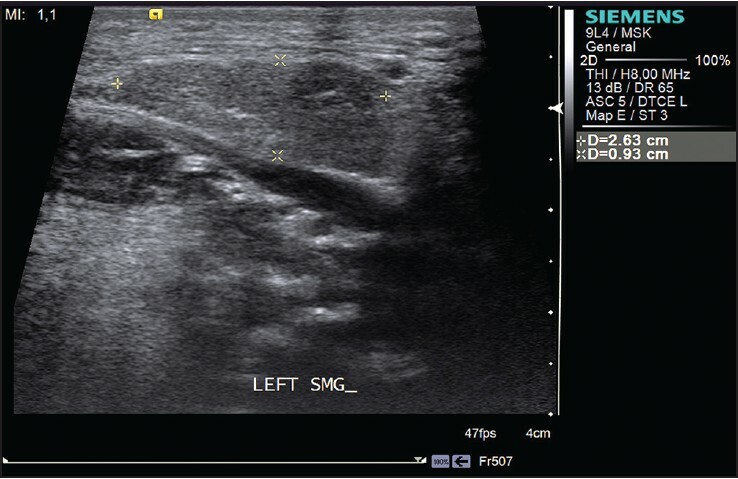 An ultrasound examination (Make: Siemens; Linear probe: 7-14 MHz) showed normal ductal morphology with no pathological findings [Figure 4], [Figure 5], [Figure 6], [Figure 7]. As sialography was not advisable in the absence of any pathological findings affecting the salivary glands, it was not carried out. 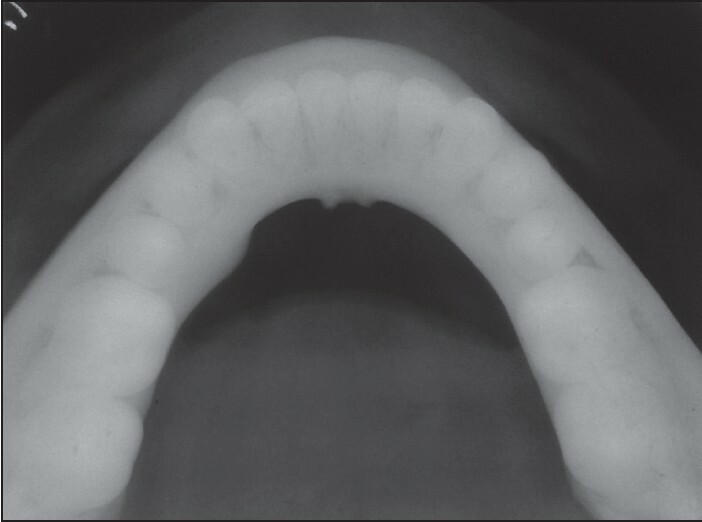 A diagnosis of enlarged bilateral submandibular salivary ductal opening (physiological variation) was made. We consider the present case as a physiological variation rather than a pathological one. 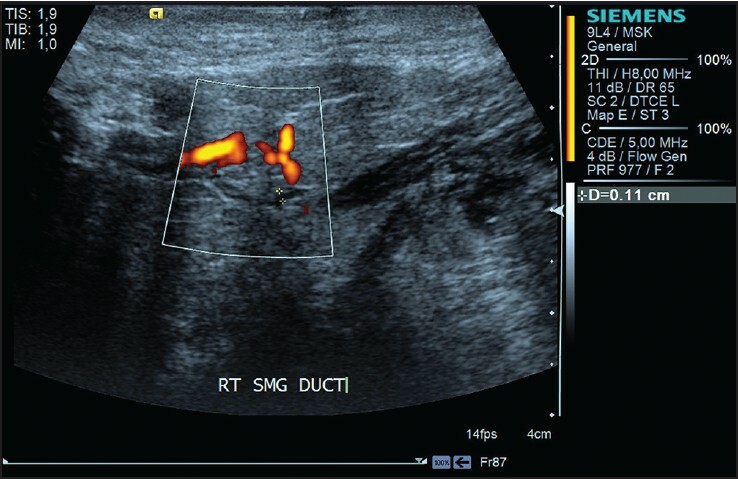 The probable reason, as seen in the present case, might be a developmental anomaly, wherein the duct of Bartholin has joined the Wharton's duct at its most proximal end. 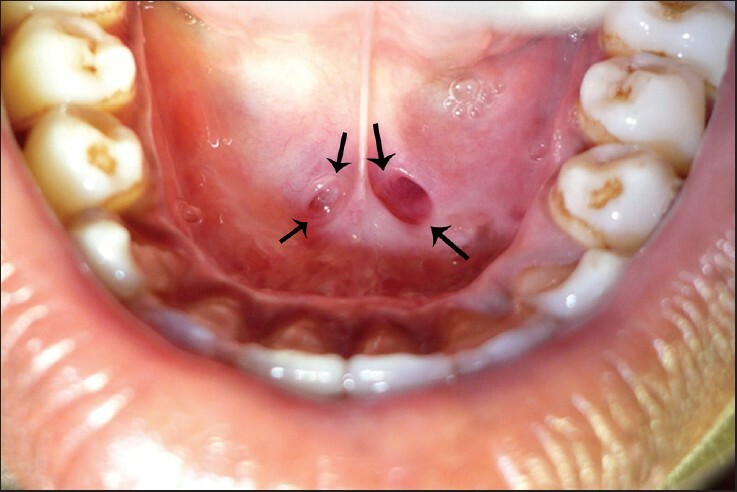 This could be one of the reasons for the absence of a sublingual caruncle in our case. As discussed previously, various signaling molecules, influencing the differential contraction of the actin filaments, might have altered the physical mechanism underlying cleft formation during gland development in our case. Exfoliation or dislodgement of a sialolith from the ductal orifice is not a rare entity. An enlarged ductal opening could be a sequel of such an episode. However, in the present case the patient does not report any such experience. The presence of such wide ductal openings located in the floor of the mouth could lead to foreign body entry into the ductal system, causing a partial or total obstruction of salivary secretion. Such variations can also favor a retrograde spread of the oral microflora leading to glandular infection and inflammation, a consequence of which might be glandular destruction. Developmental disturbances of salivary glands are rare. We are reporting a case of bilaterally enlarged Wharton's ductal openings, which appears to be more of a physiological variation rather than a pathological one. 1. Berkovitz BK, Holland GR, Moxham BJ. Oral Anatomy, Histology and Embryology: Salivary Glands. 4 th ed. Edinburgh, New York: Mosby Elsevier; 2009. p. 260-1. 2. Lamey PJ, Lewis MA. Oral medicine in practice: Salivary gland disease. Br Dent J 1990;168:237-43. 3. Pham Dang N, Picard M, Mondié JM, Barthélémy I. Complete congenital agenesis of all major salivary glands: A case report and review of the literature. Oral Surg Oral Med Oral Pathol Oral Radiol Endod 2010;110:e23-7. 4. Holmberg KV, Hoffman MP. Anatomy, biogenesis and regeneration of salivary glands. Monogr Oral Sci 2014;24:1-13. 5. Patel VN, Rebustini IT, Hoffman MP. Salivary gland branching morphogenesis. Differentiation 2006;74:349-64. 6. Sakai T. Epithelial branching morphogenesis of salivary gland: Exploration of new functional regulators. J Med Invest 2009;(Suppl):234-8. 7. Varner VD, Nelson CM. Cellular and physical mechanisms of branching morphogenesis. Development 2014;141:2750-9. 8. Singhal A, Singhal P, Ram R, Gupta R. Self-exfoliation of large submandibular stone-report of two cases. Contemp Clin Dent 2012;3(Suppl2):S185-7.